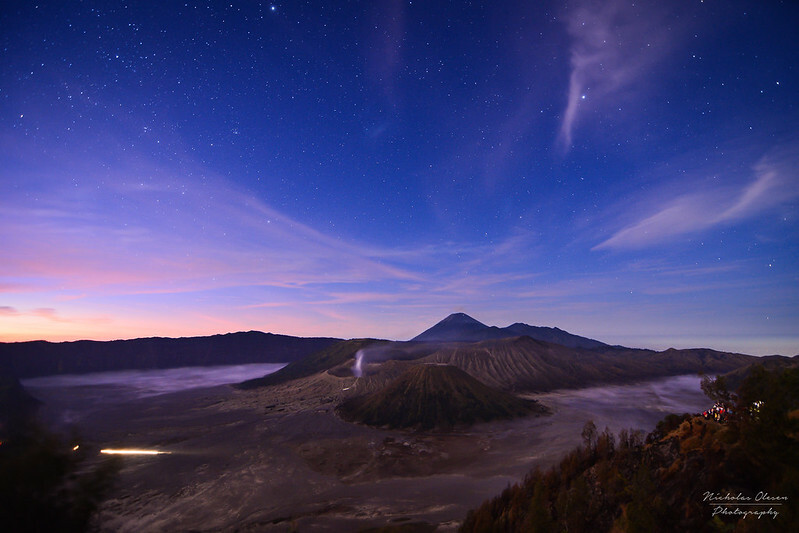 One of the highlights of a visit to Indonesia is watching the sunrise at Mt. 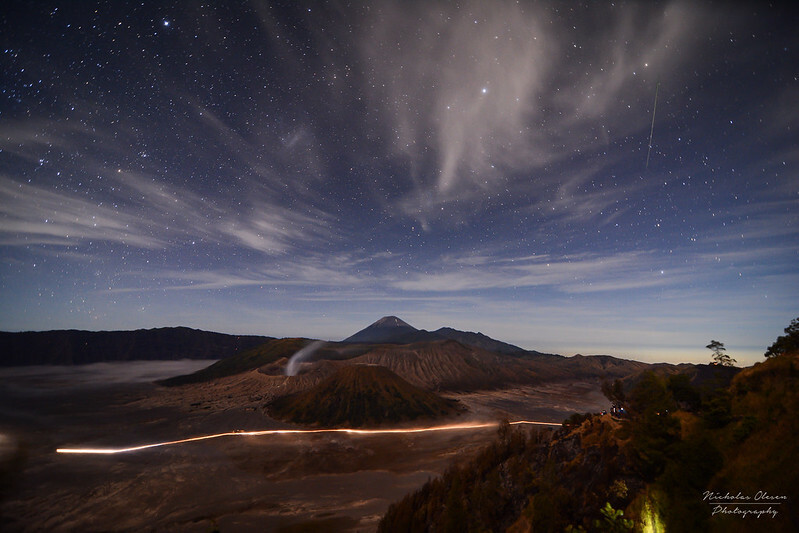 Bromo, in eastern Java. 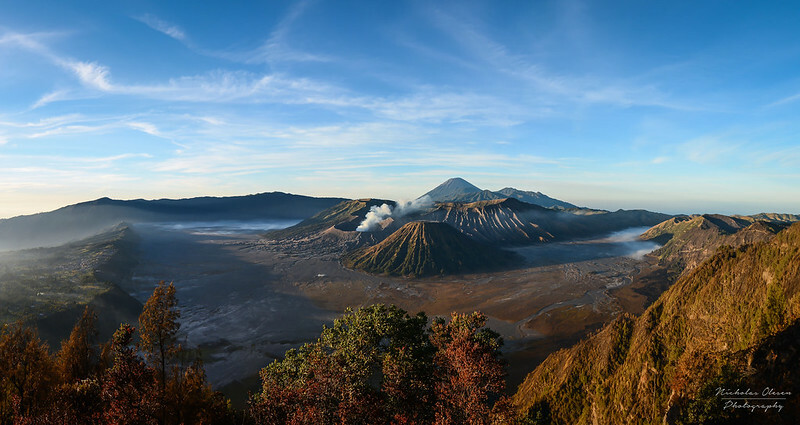 This is a view of Bromo and the Sea of Sand, with clouds gathered low above the sand on the right and a light fog gently rolling over the ridge on the left, lit up by the morning light. This image is created from 3 vertical shots, stitched together in Hugin, and post-processed in Lightroom. 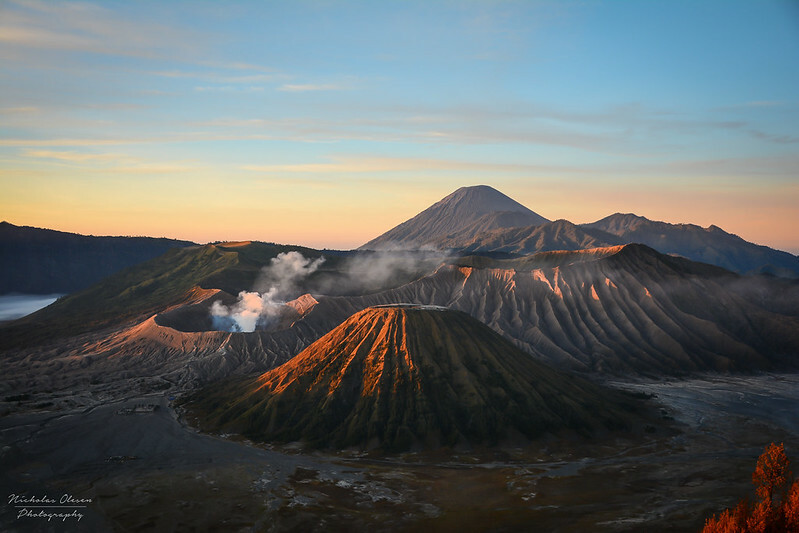 A view of Mount Bromo, on Java in Indonesia, as the sun rises and the first rays touch the cone of Bromo and the surrounding peaks. A short boat ride from the island of Lombok, lie the three Gili Islands – Meno, Air and Trawangan. We spent a couple of days on Gili Trawangan snorkeling with wild sea turtles and enjoying life on a “secluded island” – in the end Trawangan is the biggest party island of all three, so it’s not at all secluded, but with no motorized transport of any kind it still has a unique atmosphere! 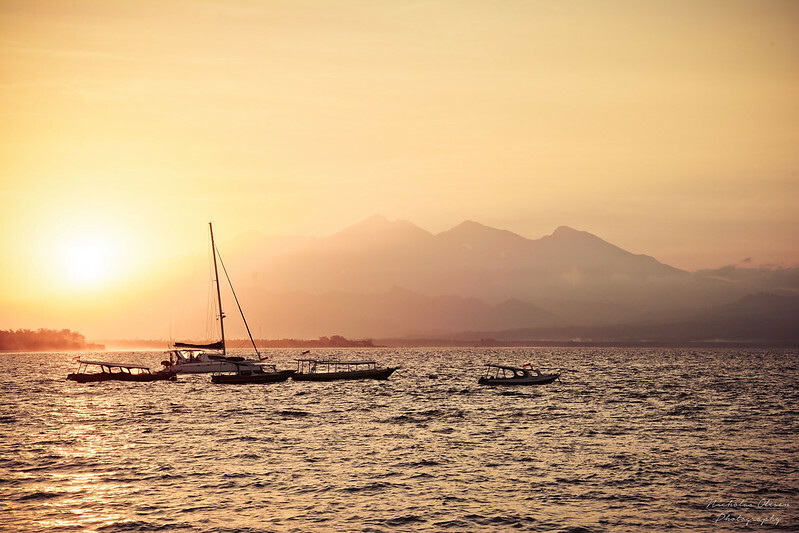 From Gili Trawangan you get a fantastic view of Lombok, including it’s highest peak, the volcano Mount Rinjani. I got up one morning to watch the sunrise; from where I was the sun came up just next to Mount Rinjani. As it came above the horizon, it bathed the landscape in a beautiful golden color. 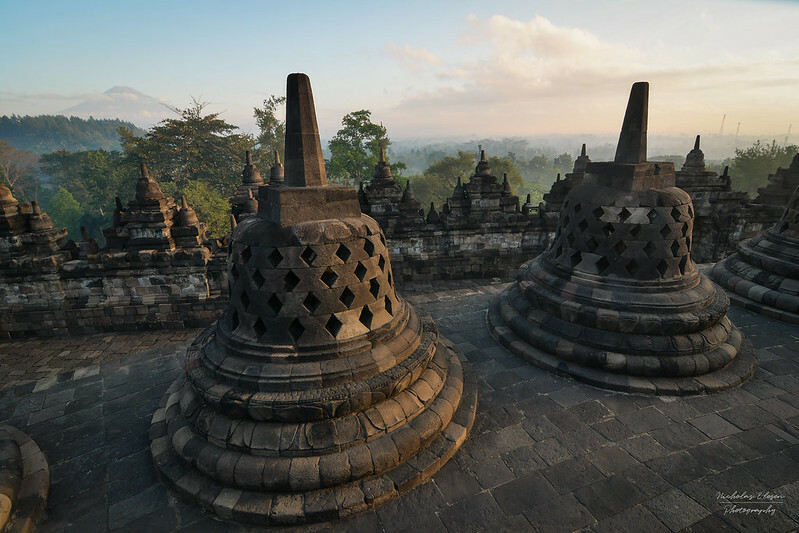 Another highlight of my trip to Indonesia was watching the sunrise over Borobudur, built in the 9th century and today is the largest Buddhist temple in the world. It’s located just outside of the city of Yogyakarta. Unfortunately a lot of tourists go to see the sunrise, so you’re hardly alone at the top! 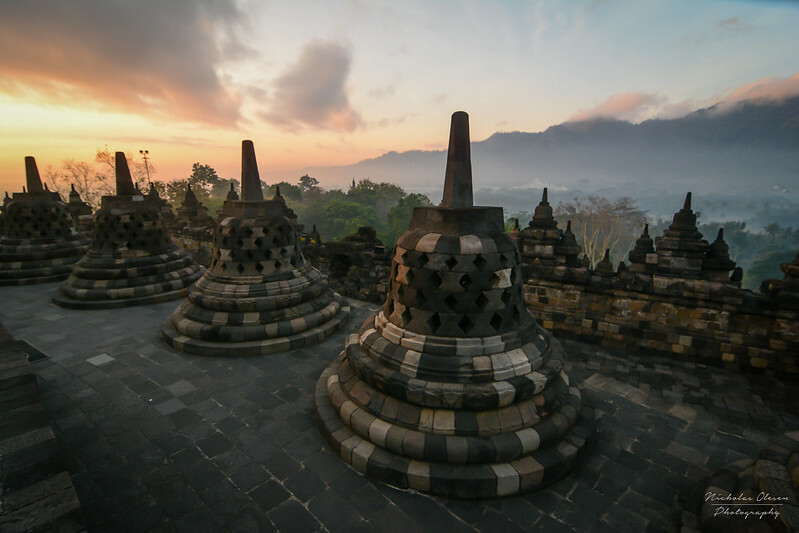 I found it even worse than Bagan in Myanmar – at least there you have hundreds of temples which you can watch the sunrise from, whereas at Borobudur there is just the one. It means you need to bring your patience with you in order to get shots without people! You also have to search for different angles, as the side where the sun rises is covered in people. Still worth it though when I see this shot!